Just wondering if any of the bcf people around the midlands, north or wales fancy a meet up. 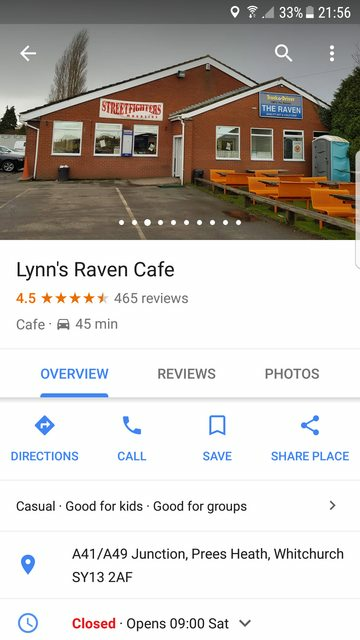 This will be at lynns raven bike cafe google maps image below. Time would be about 7pm as long as its dry. Maybe if there's a mids meeting in late August I could make it. I've got nothing on the road this year and not likely to have a bike finished and running before July. It'll need a shakedown and dyno session before I can trust it too. How's you getting on with your little 50cc twist and go anyway? I hope your finding it enough motor for the commute and not dangerously vulnerable? Good idea Sam but I wouldn't make that time due to work unfortunately. Could possibly change the time and date to a weekend. Just thinking the north and midlands never really do any meet ups anymore. Regarding the 50cc its been sold and I'm commuting back on my k again. I can do a weekend evening or a later time on a weeknight. For anyone going, and unless things have changed, this place is cash only, I've seen s a few people caught out by it.